We apologise for the delay in updates but please find the latest news below! Some major changes have happened in the Workshop with more to come. We have installed a new oven in the Paint section which arrived around Christmas but this time without the required Allen Key and the helpful Instructional DVD. We had very few drawings to work from but as you can see (more images are in the Photo Gallery) after about 4 weeks of Hard labour and pulling out what little hair we have, we have it in a new container. The old booth is gone, the workshop is gutted. We commence the build for the new oven! 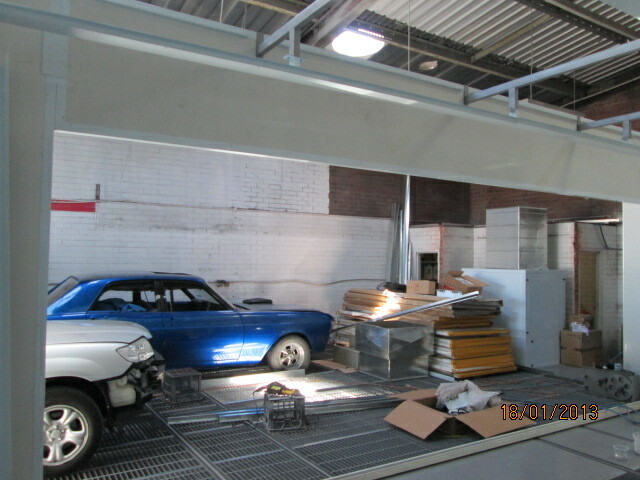 As we are finalising the build, the staff moved a restoration project into position – Falcon XY GT. As with most construction projects, there are always a few dramas. 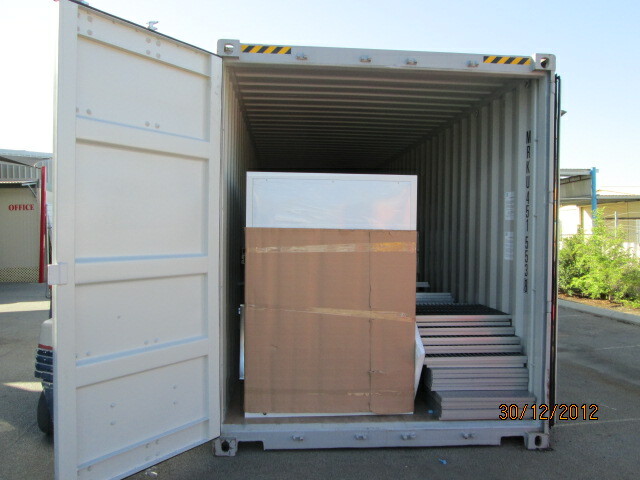 But with persistence, we overcame the issues in the Preparation Area, Rail System and the Roller Door. But soon it is “Hey PRESTO” and it’s ready for work! So what do you think? 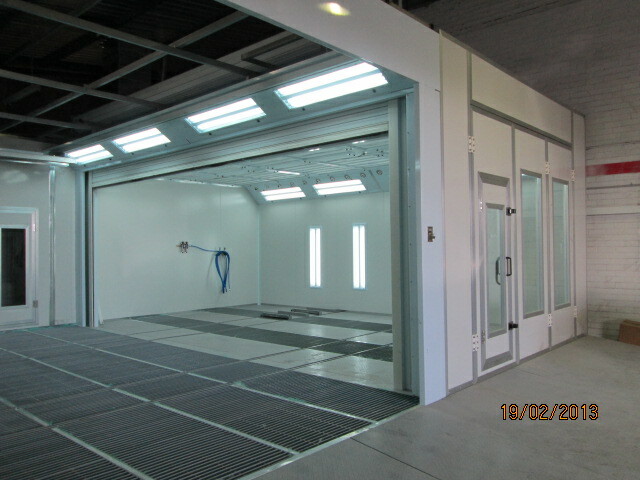 New Booth, a 2 car Preparation Area with Infra Red heating unit, Oven ready for water based paints and it all functions perfectly. The vehicle is moved into the Preparation Area onto the Platforms. Once located, it’s puttied and rubbed down. On completion, it is pushed sideways and masked for painting. 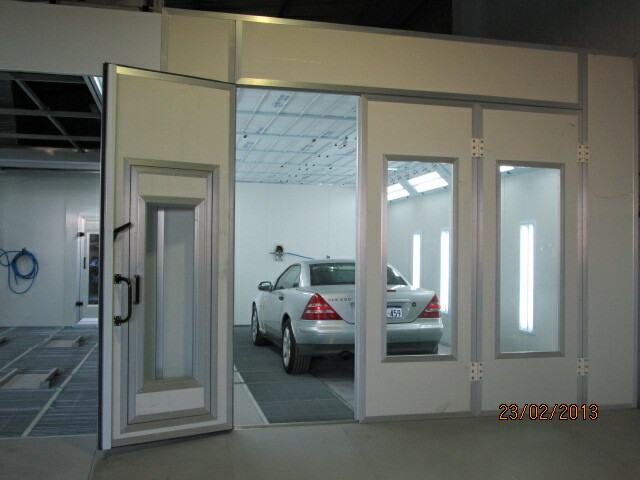 When masking is completed, the Roller Door is lifted and the vehicle is moved sideways into the Oven for Spraying. On completion, the vehicle can be moved forward from the Oven. This process leaves the space for the next vehicle to be masked. 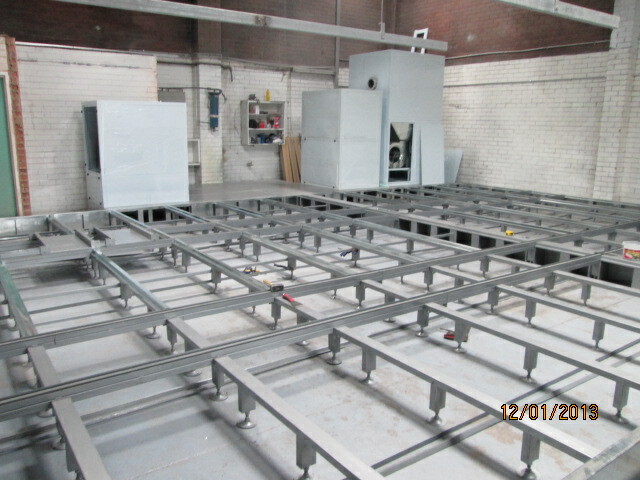 We have installed some Dust Extraction Units to maintain a healthier and cleaner enviroment to work in. This assists in making our work spaces cleaner and healthier for our staff. We have also partnered with Thatcham. Thatcham is a company who supply a subscription service dedicated to keeping the industry informed and up to date with changes to vehicles. As you are aware, vehicles and their specifications are changing rapidly and this service assists Kinglsey Smash Repairs with the latest processes to repair your vehicle. We are proud to be partnered with Thatcham. The next big change will be coming as soon as we can complete the planning processes with the Shire. We’re planning to build a new office complex at the front of the current building. This will give us a big face lift! It will provide a better Reception Area which will provide a more relaxing experience with Coffee and TV Lounges while Estimates are being completed. The Insurance Industry is changing and one of our largest Insurance Companies has reduced it’s list of “Preferred Repairers” from 200 down to 14. The selected Preferred Repairers have been contracted to do their work for an unrealistic price which the majority of Panel and Paint Owners see as un-competitive! This is not good for the Owner or us in business trying to make an honest living.